Baffle Panels | GEF, Inc.
G EF Incorporated offers a lightweight, high strength fiberglass baffle panel that is ideal for underwater flow control applications. No rot or corrosion, therefore they offer an extended life cycle over wood, steel and concrete. Available in 12" and 24" widths for ease of on-site fabrication and installation or we can pre-fabricate for you. 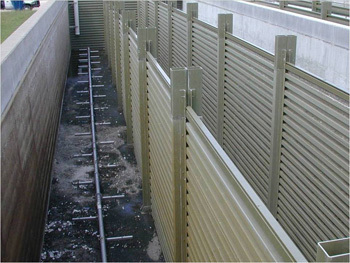 Water and Wastewater Systems, Aeration and Contact Chambers, Retention Basins.